From the author of the classic Farseer trilogy, Ship of Magic is is the first part of the Liveship Traders. Set in a land bordering the Six Duchies, it tells of a group of sea traders, purveyors of rare goods which often border on the magical. 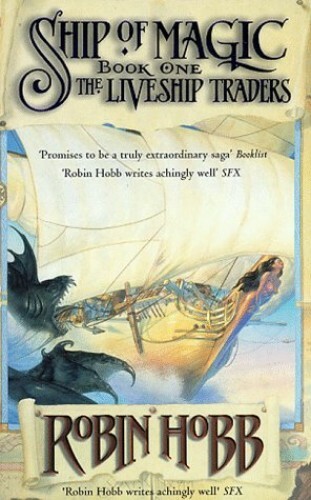 From the author of the classic Farseer trilogy, Ship of Magic is is the first part of the Liveship Traders. Set in a land bordering the Six Duchies, it tells of a group of sea traders, purveyors of rare goods which often border on the magical. Wizardwood, a sentient wood. The most precious commodity in the world. Like many other legendary wares, it comes only from the Rain River Wilds. But how can one trade with the Rain Wilders, when only a liveship, fashioned from wizardwood, can negotiate the perilous waters of the Rain River? Rare and valuable, a liveship will quicken only when three members, from successive generations, have died on board. The liveship Vivacia is about to undergo her quickening, as Althea Vestrit's father is carried on deck in his death-throes. Althea waits fo the ship that she loves more than anything else iin the world to awaken. Only to discover that the Vivacia has been signed away in her father's will to her brutal brother-in-law, Kyle Haven...Others plot to win, or steal, a liveship. The Paragon, known by many as the Pariah, went mad, turned turtle and drowned his crew. Now he lies, blind, lonely and broken on a deserted beach. But greedy men have designs to restore him, to sail the waters of the Rain Wild River once more.